Everybody has a junk drawer.. Ok, maybe not everybody, but nine out of ten of us can confess to the catch all, throw it in there, the place where lost things go, drawer. 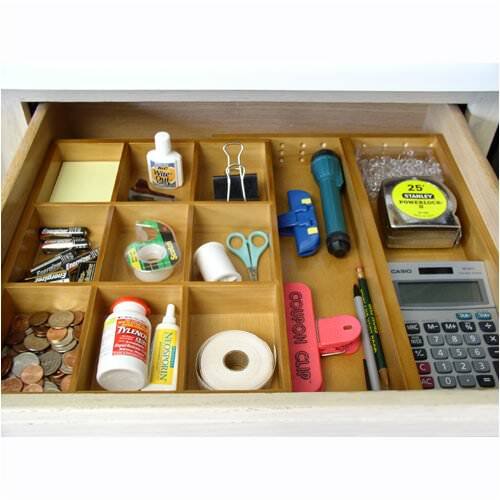 Here are the step by steps on how to organize your junk drawer! You heard me, dump out the entire thing. Why, you ask? Because that way you are forced to deal with every last piece of junk cluttering up your drawer, instead of picking it over and leaving things you can’t decide on. I know, Ive done it too! Everything that doesn’t belong in the junk drawer, move to where it does belong. How can something NOT belong in a junk drawer, you ask? Well here is how I look at it. Junk drawers are for things that have no place elsewhere. If the item in question belongs in another room, then it doesn’t belong in the junk drawer. For instance, safety pins belong in the sewing kit, and band aids in the bathroom or first aid kit. Yea, I know, judgement call here. Do your best, huh? Ok, here is the easy part. 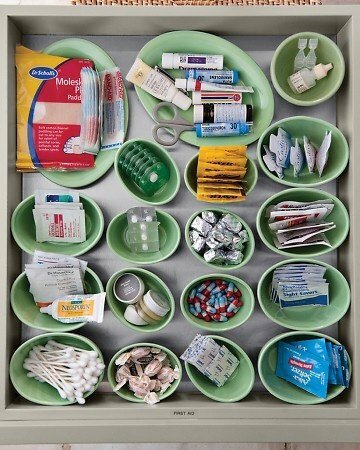 Create sectional organizers in your drawer, and actually…ORGANIZE. That means pens and desk supplies go in one space, unpaid bills in another, batteries in another…you get the idea. 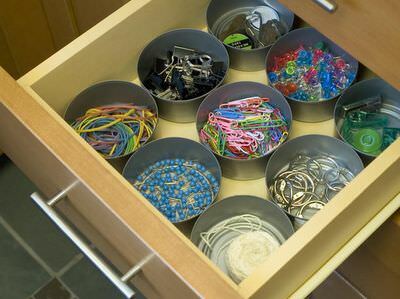 No, this is not a perfect process and one person’s junk drawer will not be the same as anothers. But there is something really satisfying about getting your junk drawer organized. It gives you just a little more control over the craziness in our lives. Yes, it does. 🙂 Here are more ideas for you! 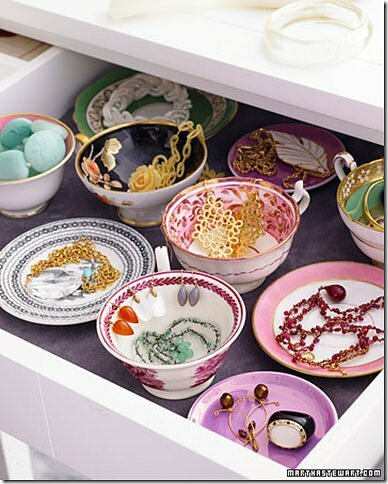 Have a need for beauty, even in the junk drawer? This idea from Martha speaks for itself! Use empty nut tins for organizing, great budget solution! We found this nice natural wood organizer on Amazon. It’s adjustable so it should fit most any drawer. 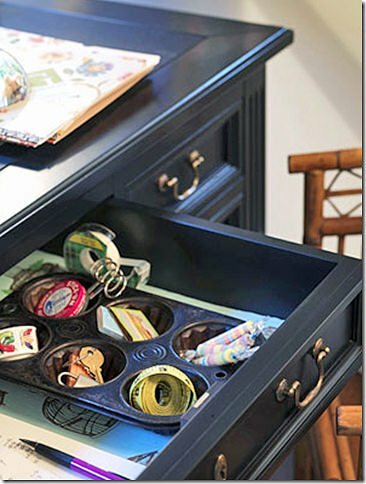 Get your junk drawer organized… you can do it during Downton Abbey commercials! Previous Post Re-Purposed Bathroom Storage Solutions! The dollar store bowls and cups are really cute but, please! !, don’t store pretty pills (even the ones still in the plastic bubble) in open places like that. Do I need to list the 20 reasons to NOT do that?? Well we hope everyone will use good common sense as to what they store in the open, of course! Great ideas here! I love all the various options and pictures. Thanks!